We recommend IPVanish to torrenters, Kodi users, and folks who need the highest standard of privacy, but keep shopping if you live in China or want to unblock Netflix. IPVanish is a United States-based VPN provider that emphasizes speed, security, and privacy. What it does, it does well, and it checks all the boxes when it comes to the standard features that are necessary for a modern day VPN. IPVanish is one of the biggest names in the VPN business, but whether its capabilities can extend beyond that of a run-of-the-mill VPN provider is a question we aim to answer in this review. We loved IPVanish and would recommend it for users who want blazing fast speeds and great privacy. It’s among the most popular with torrenters and Kodi users, however, fans of Netflix may want to try another service since IPVanish does not unblock the popular streaming service. You can see a list of the best VPNs for Netflix here and our recommended VPNs for streaming here. Prices are firmly in the middle range. A one-month subscription costs $10, three months for $8.99 per month, or a full year for $6.49 per month. All plans come with a seven-day money-back guarantee if you aren’t satisfied. Payment can be made with a credit card, PayPal, Bitcoin, and through a handful of other payment providers. You only need an email address to sign up. IPVanish coupon code/discount: IPVanish has offered our readers a 60% discount on the annual plan here or 38% on the monthly plan. What features does IPVanish have? A single subscription allows up to five simultaneous devices to be connected at once, making IPVanish a good value for a small household. Apps are available for Windows, MacOS, iOS, and Android. Other operating systems will have to manually configure a third-party app to connect, or connect to a VPN-enabled router. IPVanish is a notable favorite among Kodi users. Kodi, a free home theater software that allows for streaming video and other content from multiple sources, is often installed on Android-based devices like the Amazon Fire TV Stick. Unfortunately, many of these devices do not have access to Google Play, and they are operated via remote control instead of a keyboard and mouse or touchscreen. IPVanish allows users to directly download its Android APK directly to their device, and the interface is remote-control friendly. Beyond the initial sign in, there is very little typing required to get up and running. Everything can be selected via drop-down menus, and there’s no need to struggle with maps or other interfaces that don’t gel well with remote controls. IPVanish allows torrenting on all servers. P2P filesharers and frequent streamers will be glad to know that there is no cap on bandwidth or data. 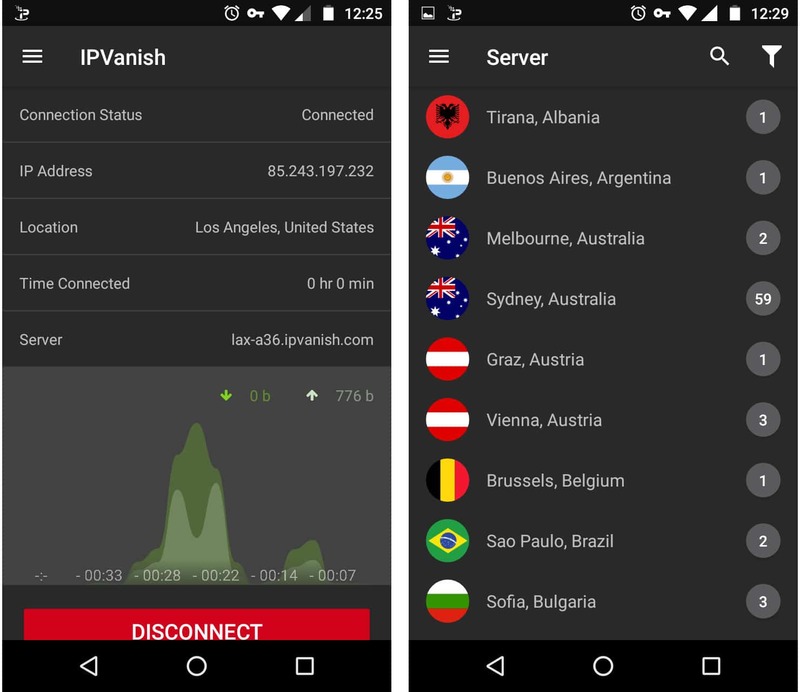 The IPVanish apps come with an optional kill switch that halts internet traffic should the VPN connection unexpectedly drop. DNS leak protection is built in, including IPv6 leak protection. The company keeps no traffic or usage logs on its customers. It does not record your source IP or any of your online activity. Setup and interface – how easy is IPVanish to use? Once you’ve created an account, setting up IPVanish is a breeze. Just download and install the app for whatever operating system you use and log in with your account credentials. There’s no need to validate individual devices or enter a two-step verification PIN, however, the desktop version will require a restart after initial installation and major updates to get up and running. We tested the apps for Windows 10 and Android. The desktop interface opens to a quick connect menu where by default you’ll connect to a nearby server using automated selection settings. These can easily be changed to choose a preferred country, city, and even an exact server domain via drop down menus to suit your needs. Once connected, a live readout of upstream and downstream traffic, as well as a couple other handy statistics like protocol and time connected, are displayed. If you prefer a different method of connecting to a server, IPVanish has you covered. You can search the full server list in the location menu, choose a location from a map, or use advanced filters to narrow down server selection by protocol, country, and latency. Latency loosely corresponds with proximity, and a lower latency often means a faster connection. Many of the more technical features can be found in the settings menu. These include startup behavior, updates, kill switch, DNS leak protection, obfuscation, port number, how often your IP address is changed, DNS configuration, and the local client log (this log is stored on your computer, not on IPVanish’s servers). If you close the IPVanish window, it will continue to run in the system tray. By right clicking the system tray menu, you can connect and disconnect from the VPN, change your IP, bring up the main window, or exit the program. The mobile app gives a similar readout of upstream and downstream traffic as the desktop app. You may search or browse locations in list form, and apply filters by latency and country. In the Android version we tested, you can opt for OpenVPN over TCP or UDP, enable obfuscation via the « scramble » toggle, choose a port number, and select how often you want your IP address changed. The mobile app did not offer an internet kill switch, unfortunately. Overall the apps are responsive and seem well designed. As we mentioned earlier, IPVanish is a good option for devices that are controlled via remote control, such as Amazon Fire TVs running Kodi. As of time of writing, IPVanish operates more than 350 servers in over 60 countries. That’s quite a lot but for a provider of this size, about average. The countries with the most locations include the US (9), UK (5), Canada (3), India (5), and Turkey (3). Server switching is unlimited. We were able to stream 1080p video without stopping to buffer while connected to our primary test servers in the US and UK from my location in Lisbon, Portugal. When we played a few matches of Brawlhalla, a Super Smash Bros-style online fighting game, performance ranged from slightly laggy to almost unplayable when connected to the UK server and playing on European servers. Your mileage may vary, but we recommend gamers only use the VPN during off-peak hours. While the service was not the fastest we’ve tested, it is remarkably stable. Not once did the connection drop during our test period. Thanks to the « Best Server » option, which automatically connects you to the fastest server after setting the location, we never ran into a down server. To make the speed tests as empirical as possible, we downloaded the same 82.7MB file (compressed from 103MB) from a server in Chicago three times on three different VPN servers at three different times per day for a total of nine tests. As a control group, we also did the same without a VPN. Below you can see the results alongside some previous tests from competing VPNs. We conducted these tests from Lisbon, Portugal and Berlin, Germany. For both, I connected to two servers in the US–East and West Coast–and one in the UK. In the boxplots below, the thick black line represents the median download time, while the red diamond represents the mean. Lower is better. Keep in mind that this test is not a definitive indicator of which VPN is fastest. The inherent volatility of the internet adds a significant factor of randomness, so VPN speed tests should always be taken with a big grain of salt. My testing locations were in Lisbon, Portugal and Berlin, Germany where I run these tests on 15 Mbps and 10 Mbps connections, respectively. Those with faster connections may well notice a larger discrepancy in speeds. Does IPVanish work with Netflix? Unfortunately, IPVanish does not unblock other countries’ Netflix catalogues. Attempting to watch a video on Netflix while connected to IPVanish will result in an error message indicating that you are using an unblocker or proxy. Likewise, IPVanish doesn’t unblock Hulu if you are outside of the US. Compared to the top-of-the-line competition, IPVanish falls short in regards to geo-unblocking. In our testing, it did unblock BBC iPlayer, HBO Now, Amazon Prime Video, and Sling TV. IPVanish users can bypass China’s Great Firewall to access blocked sites like Facebook and Youtube, but there’s one big caveat: you can’t use the IPVanish apps to do so. Instead, you must use a third-party OpenVPN app to manually configure a connection for each server you wish to connect to. IPVanish says this is because its server domains are blocked within China, but its server IP addresses are not. Setting up manual connections isn’t very difficult, but it’s not as easy as using the apps and is certainly more tedious. You also don’t get all of the features that come built into the apps, like modulating IPs, a kill switch, and traffic obfuscation. Other than when an account is first registered, IPVanish keeps no record or log of VPN use on its users. If you sign up with a burner or fake email account using another service that masks your IP, such as Tor or another VPN, then you can effectively sign up anonymously. And since Bitcoin is available as a payment method, you can even make anonymous payments so long as you use properly mixed bitcoin. IPVanish uses 256-bit encryption on the OpenVPN protocol by default. SHA512 is used for authentication, and a DHE-RSA 2048 key exchange supports perfect forward secrecy. These are all up-to-date and 100 percent secure encryption standards, and perfect forward secrecy ensures that past traffic data cannot be decrypted even if a hacker or someone else obtains the current decryption key. The company operates its own DNS servers and DNS leak protection is built in, as is a kill switch. IPVanish is based in the United States. This might raise concerns for users wary of the NSA, FBI, and other law enforcement or intelligence agencies with a record of covertly spying on people with the help of US-based tech firms. IPVanish’s zero logs policy should ease these concerns, and the company has no public record of anyone being arrested or hacked as a result of using its service. Despite that, some users will still be put off by any VPN provider based in the US and the countries it cooperates with on intelligence gathering. 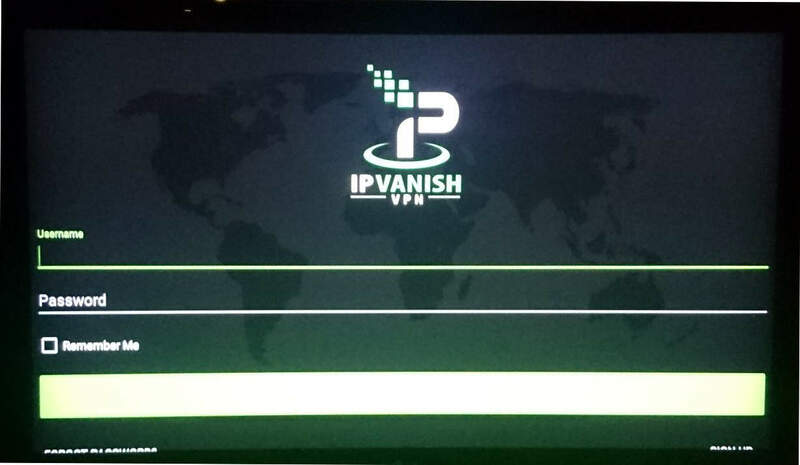 IPVanish is one of very few providers that owns and operates all of its physical hardware, rather than renting it from a third party. Whereas most VPNs simply rent servers around the world, IPVanish buys them. There are pros and cons to this. Obviously, IPVanish maintains greater control over who has access to its servers. But owning servers also makes a provider less flexible under certain circumstances, such as when a data center where the servers are housed lowers their privacy or security standards. It’s much easier to end a lease and rent another somewhere else than it is to physically move a server. Users can specify how often they would like their IP address to change down to a minimum of every 45 minutes. A checkbox in the settings will enable traffic obfuscation. In the mobile app, this is labeled as “scramble”. This is helpful in certain situations where you don’t want your ISP or some other entity between you and the VPN server to know that you’re connected to a VPN. In regards to VPNs, obfuscation makes encrypted traffic look unencrypted. In some countries where deep packet inspection is used to identify and block encrypted VPN traffic, like China for example, obfuscation can be helpful. Unfortunately, it won’t help unblock servers that have already been blacklisted by their IP addresses or domains, the latter of which is the case in China. IPVanish uses external email providers for support and other communication with customers. The only information on hand is users’ email addresses. No customer information is stored or accessible. Is IPVanish good at customer service? IPVanish customer service is limited to an email form on its website. You won’t find any live chat or phone support here. For real privacy buffs, this is a good thing because it means all customer service is done in house and doesn’t travel through a third party operator like Zendesk. For most people however, it just means a slower response time. The company says it has support staff available 24/7, but a support ticket we submitted says that a reply could take one to two days. A fairly thorough knowledge base is searchable on the company website. 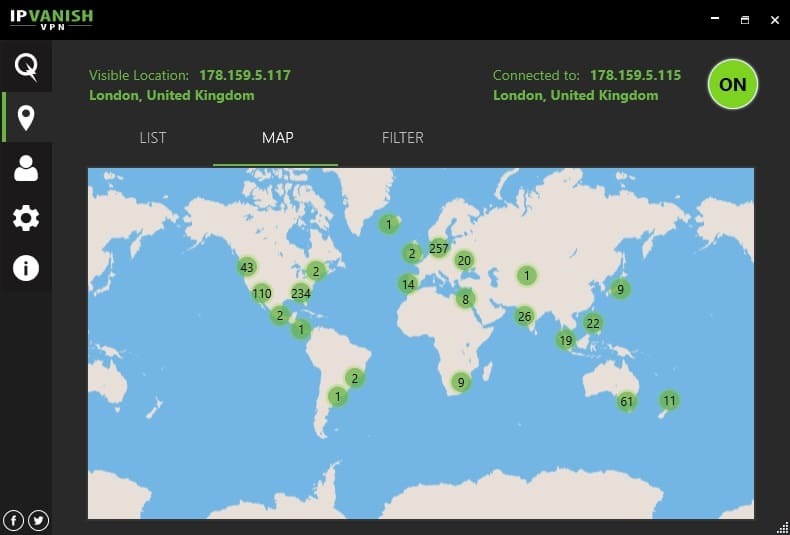 IPVanish is an easy-to-use VPN service with plenty of simultaneous connections, apps for the major device platforms, strong security, no logging, and average speed. A wide range of servers are available. DNS and IPv6 leak protection, traffic obfuscation, and a kill switch are all built in. If you want, you can sign up and pay anonymously. The interface is easy to use with Kodi and other Android-based media systems. The service falls short when it comes to unblocking content like Netflix and Hulu. Users in China and possibly some other censorship-heavy countries won’t be able to use the slick apps to bypass blocks and blacklists. These are some of the most popular use cases for VPNs these days, so it’s a shame that IPVanish either can’t or won’t overcome those hurdles.